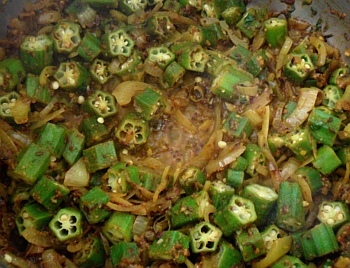 Tender Bhindi makes an ideal focus for sabji. 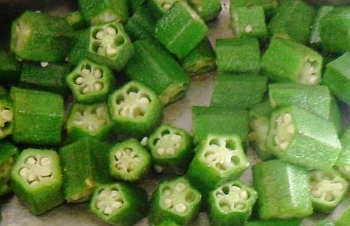 First of all, read the notes on the ingredients page on bhindi (opens up in a new browser window) so that you have an idea of what you are dealing with. Dry-roast jeera on a dry tava. Heat up a tava and without adding any oil, put the jeera on it and roast it until it goes a medium brown. You can stir it around with a spurtle or a spoon but to roast them evenly, they all need to be in contact with the tava. To do that, just slide the tava from side to side and they will settle down. Once it is ready, tip half of it into a large cooking pot and carefully tip the rest into a mortar and pestle. Grind the roasted jeera into a fairly fine powder and add to the pot. 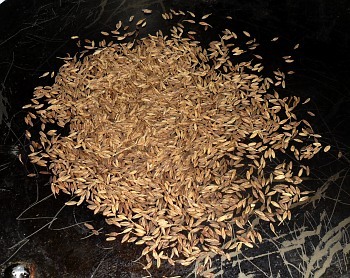 Normally, when you roast jeera, you do it in oil and you don't break open the seeds - you get a little 'jeera taste explosion' whenever you crunch through on of them when you eat your meal. However, grinding some of them up introduces the flavour of the inside of the roasted seeds into the meal as a whole before you eat it, giving it a different overall flavour. 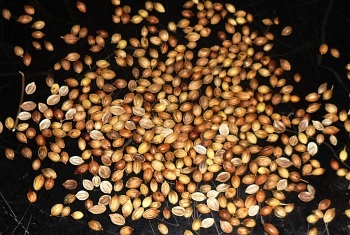 Now roast the coriander seeds on the tava in the same way. You will notice their smell as well - normally, you would use powdered coriander and fry it but this is different. Once they are roasted, grind them all up and add the powder to the cooking pot. You can do this roasting and grinding with the other recipes on this site instead of using the powdered spices - I know some people who never use the powdered spices, always roasting and grinding whole seeds themselves. avoid conact with too much water. Add some oil to the roasted seeds and powder in the cooking pot and heat it up. Add the hing and let it bubble and stain the oil yellow like it normally does. Add the cardamom powder - this is another one that you might want to experiment with in other recipes. Then add the turmeric and fennel seed. Next, add the chillies and fry them for a short while - see the knowledge page on this topic - and then the onions, garlic and ginger. Wash and chop up the coriander leaf and add that to the pot. and sprinkle on some lemon juice. Next, wash and then top and tail the bhindi. Cut it into roughly 1cm lengths and then stir-fry it in another pan, in olive oil. Doing this prevents it from coming into contact with too much water - the only water there is what condenses from the bhindi. Once it is cooked enough, add it to the cooking pot with the rest of the vegetables. Sprinkle the lemon juice on it to stop it from going slimy and cook it for around 10 minutes. Finally, stir it up and divide it up between the lunch boxes. Here, it is served on a bed of rice. 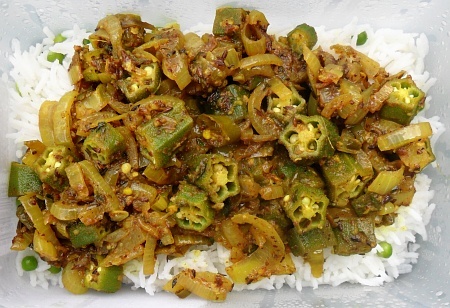 Serve the bhindi ki sabji on rice or alternative of your choice. 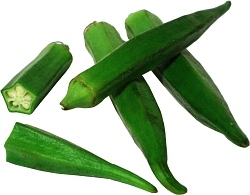 Bhindi has a very short shelf life so you might find it convenient to keep some frozen bhindi. You can use this when you feel like it and without having to plan ahead as you would with the fresh bhindi. Instead of rice, eat them with roti.